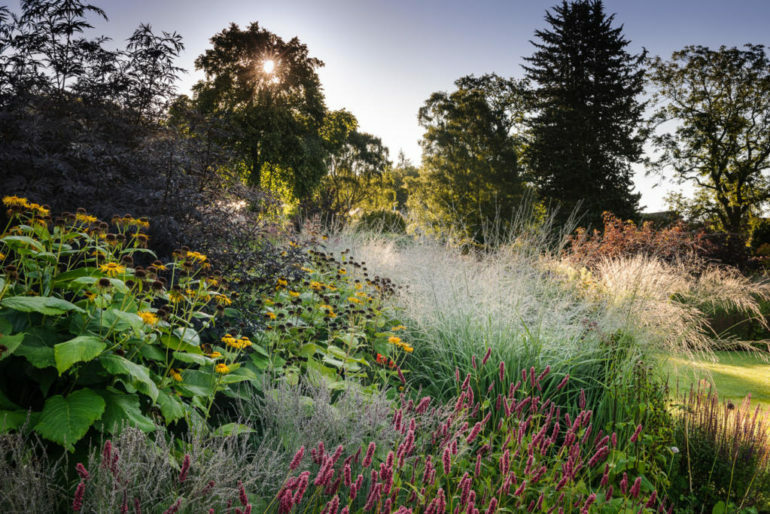 We would all like our borders to give us lasting displays of colour. A border being raised, like a bank, give the plants good drainage, which is the key to a long life and encourages hardiness. Always incorporate organic matter to improve soil structure. Once you have the drainage in check you can begin to think about which plants would work well in your garden. Agapanthus and Hedychium (the Ginger lily) are both exotic and give good architectural structure to a border. They aren’t hardy in every garden but their vibrant foliage will help provide an anchor for airier plants surrounding them. The Ginger lily’s striking orange flowers only last for about ten days, but they are definitely a statement piece, and are hardy if planted in a sheltered position. The bold foliage from spring through to autumn give a great backdrop for plants in the foreground. The leaves look a bit like that of the Canna lily’s and and if planted with sanguisorba (Great burnet) and purple asters they look magnificent. Hedychium grow to 1.8m in height and like full sun to partial shade. The floating display of ‘Siskiyou pink’ Gaura Linheimeri is a key plant to use for its long flowering season – it will still be looking radiant in November when other flowers have gone. The white Gaura is also lovely and looks wonderful interwoven through a border, especially around roses. Gaura is a perennial plant reaching a height of 1.5m and a spread of 1m. They need full sun and moist soil with good drainage, but they will tolerate dry soil and a semi shady location. Contrasting colours are great to use within mixed border plantings. Deschampsia cespitosa is an evergreen grass, and grows widespread in damp soils. It reaches a height of 1.5m. Their delicate grey-green stems age to a golden hue which create a light airy effect. They look perfect juxtaposed with the bright red of Persicaria amplexicaulis ‘Marchant’s Red Devil,’ or with Persicaria amplexicaulis ‘Alba’s,’ slim green stems with white spikes. Perennial, Persicaria amplexicaulis flower for months on end and grow to a height of 0.9m. Lythrum virgatum, otherwise known as Dropmore purple, is a clump forming perennial with attractive light foliage, with a long summer crop of vibrant pink-purple flowers. They grow to a height of 1.5m and spread 0.5m, they like a full sun location and flowers are prolific through summer and autumn. They look fantastic planted near to Deschampsia cespitosa and Persicaria. Secret Garden Landscape & Design Ltd. It's a beautiful morning for the last day of the holidays. What better way to spend it than buying some Alliums and planting them in your garden? Read on for planting ideas... Enjoy! Health benefits of Dandelion tea are scientifically proven. If you're gardening this weekend and find some in your garden, what about digging them up and making a brew?